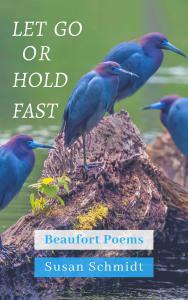 BEAUFORT, NORTH CAROLINA, US, December 6, 2018 /EINPresswire.com/ -- About her new book of poems LET GO OR HOLD FAST, author Susan Schmidt says "part of me delights in all I witness of the beauty of creation, part of me is mourning/ grieving losses I observe, and part is stomping mad at powers that don’t protect our critters, our waters. Long ago, I worked for government writing regulations to protect the environment, interpreting science for decision-makers. I wrote grants to raise funds to buy natural land. I taught ethics in classrooms thirty-some years. I figured I might accomplish more by writing to move people’s hearts to love birds, wildlife—and inspire them to work to protect wild habitat." The book is dedicated to Science, Endangered Species, Migratory Bird Treaty Act, Clean Air, Clean Water, Wilderness, and Neighbors (including wildlife as well as humans).